Don't know where Cory keeps his optimism or how he imbibes it before coming out with such statements. A new analysis by The Colorado Sun found that all but one of the state’s seven congressional districts is shifting to favor Democrats, including once rock-solid Republican turf. And a handful of one-time swing counties now appear solidly Democratic in the era of President Donald Trump. In my county, more of the unaffiliateds swung red. But we still reduced the R margin from +30 to +10 on the statewide races. The local ones, not so much. But the Sun considers the eastern plains to be GOPers last stand, one of the two areas in Colorado that are still reliably Republican. They'll probably send a reporter out to interview Trumpers and ignore all those pesky plains Democrats. We just don't make for very good human interest stories. Going from being 30 points under water to only 10 points is progress. I live in a county that used to be a Republican stronghold but this year Dems won all but one county office, all of the state senate seats up this cycle, and all but one state house seat. You have to admit that the outlandish (i.e., batshit crazy) stuff that comes out of the mouths of the Trumpets is a lot more "interesting" to publish than the generally more bland stuff that Democrats say. Although I would not necessarily use the term human interest when characterizing what the Trumpets preach. So now, some inside the Federalist Society (including Kelleyanne's husband George) are regretting the deal they made with Donald "Satan's Favorite Son" Trump. Apparently, they are surprised and dismayed that he doesn't respect either the rule of law or the truth. They thought he took the Frat boofing during pledge week just like the rest of the swells and was now one of them. Now they are wondering how could they have been so mistaken. And oh, dear, what should we do? Hope Cory saves a copy of Coffman's post-election talking points memo. He's going to need them come 2020. 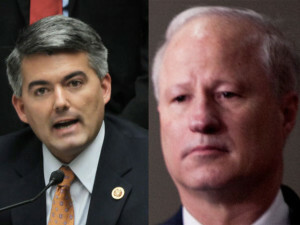 If there is a merciful God in Heaven he will move Cory Gardner to be at Trumps side when Trump campaigns in Colorado in 2020. Almighty Yahweh please allow the press to get close ups of the two hugging and being BFF's. It will be one to publish over and over again. Bring the traitor Trump to Colorado Gardner, it will be the final nail in your coffin.